All mythologies surrounding this beautiful constellation involve some person being changed into the form of a swan. Most of the changes occurred at the time of death. Cygnus, son of King of the Liguarians, is one example. He was mourning the death of a close friend and therefore incurred the pity of Apollo who changed him into a swan and put him in the heavens. The truth is that we, too, are changed into a beautiful new creature at the moment we die to our old selves and trust Christ. An interesting astronomical feature in this constellation is the famous Northern Cross. It is best seen at 9PM on Christmas Eve in the Western sky. The cross is lying on its side as it rises. What better way could there be to remind us on that most special evening that the Lord Jesus came to die on a cross — and that our happiness and life’s purpose is found in our own death in Christ as we die daily, taking up the cross (it’s lying down!) and follow Him. 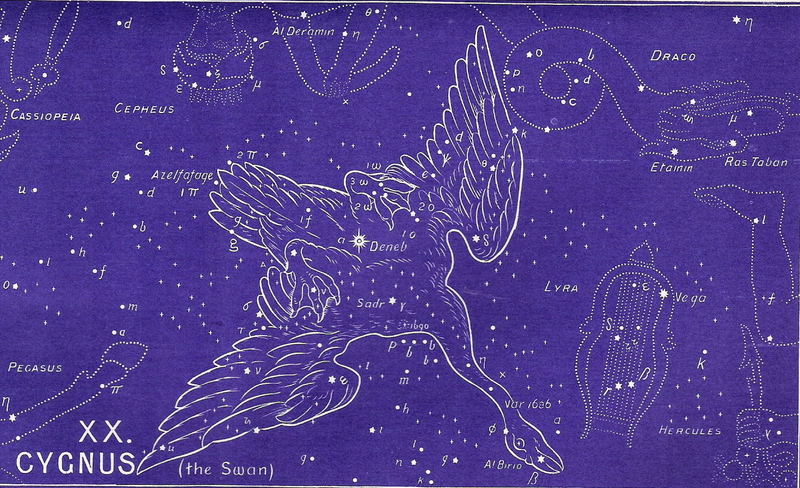 This is a swan, and this picture is found on all the old star charts. And what better picture could there be because the swan is the universal bird — found in every country of the world. The swan is seen soaring across mid-heaven bearing truth by its many names (see The Star Names below). It comes from afar (again, see The Star Names below), and as such bears the responsibility of an ambassador. With each decan of Aquarius, we see a new and impressive provision that God has given to us as co-heirs with Christ. Remember that all of Book Two (comprising Capricornus, Aquarius, and Pisces and all their decans) of this ancient star revelation discusses the blessings we have in Christ while HERE on earth. With Cygnus, we see that our citizenship is in Heaven, and as a citizen of Heaven we have all the rights of protection, respect, participation, and many other such things. But perhaps one of the most important privileges we have as citizens of Heaven is shown here in Cygnus. We are to be ambassadors, representing our “country” to others. In fact, that very title — ambassador — is given to us in Scripture. II Corinthians 5:20 says, “We are therefore Christ’s ambassadors, as though God were making his appeal through us.” Can you imagine that God would allow us to appeal on His behalf? I stand amazed. To continue in the correct order of the ancient star chart, please select Pisces next.